This week is a journey to a place of powerful peace within us. The dance is our vehicle, our life force the wind in our sails and our intuition the compass, who guides us to our unique, authentic expression in this moment. Together we embark into the landscapes of Soul Motion. Through the dance we explore the relationship to self, to another, to community and to the great force of life. We learn that predestined paths might be helpful at times, but often happiness, aliveness and the magical place or powerful peace can better be found by leaving well-trodden ways. The perfect place to practice this is the volcanic island of Gomera. A place where the elements of nature can be experienced in a very direct way. Our refuge is the Finca El Cabrito, a unique hotel and seminar centre that can only be accessed by boat. No touristic atmosphere, but serenity and peace accompanied by the forces of nature, the wonderful sea and the warm sun. We will be served organic food from the own garden and dance in our dance room directly at the beach. In the mornings we will be witness of a stunning sunrise over the ocean. No previous experience is required, everybody is welcome. Schedule: The Saturdays are the travel days. 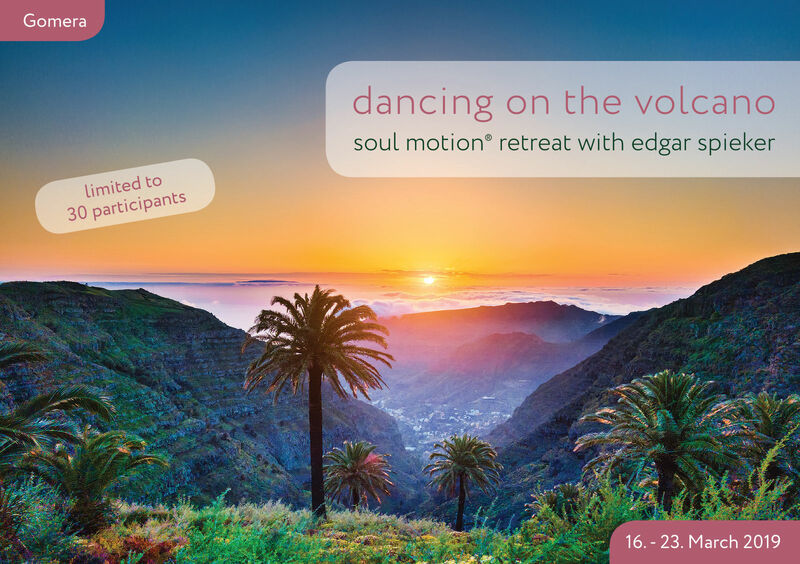 Sunday-Friday: Soul Motion Sessions after sunrise (90 Min.) and in the afternoon (120 min). Wednesday is reserved for excursions or other activities (only Soul Motion morning session). The Finca also offers botanical tours through the gardens, guided hikes, wale or dolphin watching, or massage treatments. Fee: €. Workshop Fee: Early Bird: 320 € when registering before 31.10.2018, after that date: 350 €. Accomodation and meals starting at 539 €. Shuttle from the airport and ferry to Gomera 70 € (Return). Not included are the costs for the flight to Teneriffa South.